Seventy million votes came in last night. You know I think Jennifer Lopez can wear just about anything but that thing she was wearing tonight did not fit right. Phillip Phillips returns to the Idol stage tonight. Randy Jackson is going to introduce us to Kodaline from Ireland. At the postshow dinner, the contestants talk about when is it okay to be sharp and when it isn’t because they are confused. I can understand that they are getting mixed messages. Emily, Sam, Jessica and Ben are in the first group to hear the results. Emily is in the bottom 3. The rest are safe. Phillip Phillips sang “Raging Fire” and as he did I was thinking something is really wrong with the Idol sound. His intonation (smile Harry) was all over the place. Majesty, Dexter, Jena, and Alex are up next. Dexter, Majesty and Alex are safe. Jena is in the bottom 3. That just is not right. None of them deserved that spot. Kodaline played next. They have an interesting sound. Last to learn their fate are Malaya, MK, CJ, and Caleb. Caleb is safe (OF COURSE HE IS). CJ is also safe. MK and Malaya were in the bottom three last week. One is safe and the other is in the bottom three again. Malaya is safe and MK is not. MK, you need to really bring it next week. We want you to succeed. And (no surprise) the save is not used. Tonight’s theme was “home.” The contestants were to do a song that defines that and what it means to them. Does it mean their town, their family members, or something else? What does “home” represent to them? Was I the only person who was hoping the ladies would grab Ryan Seacrest and put him in the mosh pit with them? Song: “Suddenly I See” by KT Tunstall: Symbolizes her family and how she was raised. My thoughts: I liked it. I really like the uniqueness of her voice. I also like that she makes it a little different so it does not sound like the original. The judges: Keith: Likes her stage presence, that she was coming to life. He was not mad about that specific song for her, but liked the way she started to move around. Jennifer said she is on the precipice of really blossoming on the stage. She loves how she can make the song her own. It is the mark of an artist. Harry said he liked the switch in the melody. He wanted to see more energy from her especially at her age. My thoughts: I adore his grandmother. I’m such a fan of Alex. He had a few little breath issues. And it was a bit pitchy for him. But I still loved it because he tried to change the song for himself. The judges: Jennifer said he looks like he belongs on stage. It wasn’t his best vocal performance. The arrangement did not quite fit the song. It overtook his vocal and performance. She advised him to be careful with that balance. Harry said he is so used to hearing him at an intimate context (yet last week he didn’t like the intimate performance). It sounded similarly to what Jen said. He didn’t think it was a home run but admires him for trying to do something different this time. Keith thought the word instability came to mind for the performance. The song was around him instead of him being “in” the song. Another giveaway is the loss of breath at the end of phrasing. My thoughts: If this song has been in her set for years, it should have sounded better. I prefer when she sings from a dark place. This was not a good song choice for her. The judges: Harry said she normally is so in tune. She was so off here. She really wasn’t present in the performance. Harry gets booed. Keith loves her musicality. With pitch and that (what Harry was saying), he does not always agree. Jennifer said she is with both of them. She feels like she is comfortable but it is not coming off that way to the audience. It was so sharp through the whole thing. But if she would have been singing with so much more conviction, it wouldn’t have mattered. My thoughts: It was nice. I’m sorry that I’m not a big country music fan. I like him and the puppies are adorable. The judges: Keith said it was the perfect song. He took liberties with the phrasing. He showed his vulnerable side. Jennifer said she feels like they are being a little hard on everybody tonight. She liked that he surprised her. Harry wants to be completely honest. It was unquestionably the best performance of the night (so far). It was a great performance. My thoughts: I have mixed emotions about the Marine boyfriend video. On one hand, they could just be celebrating and being grateful for his service. On the other hand, people feel obligated to vote for her just because of that and sometimes it pays off and sometimes people hate being manipulated and refuse to vote because of that. As far as her performance, the band guy looked uncomfortable when she was singing and dancing next to him. It was in tune but it did not have enough oomph to get me up and want to dance or sing along with her which is the purpose of the song. The judges: Jennifer said she did a really good job. She loved it but she is biased. Harry said he thought it took a lot of courage but she has to match the intensity of the locomotive train. She has to drive the train and the production was too big for her tonight. Harry gets booed again. Keith loved it. Harry says back to Keith that he wants her to improve. Keith said to be more confident. My thoughts: My favorite so far tonight. He could honestly go on tour right now. The judges: Harry: He is the most consistent performer on the show. Always consistent, but he knows how he feels before he goes on to sing. What can he bring to rock and roll to make it modern? How can he not be predictable? Keith said he is one of the best singers he has heard in a long, long time. It was a bold thing. Keith talks about rock and roll and the need for a band. His challenge to Caleb was how does he get that thing going on without the band around him. Jennifer said it is what she has been waiting for all night. Great job tonight. 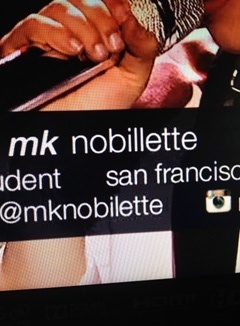 My thoughts: Once again, they put her name up as MK Nobillette. She looks terrified. I don’t know if that is what caused her to lose breath control and be off key. The message that came across to me was she feels defeated and feels like what is the point (because she was in the bottom 3 last week). The judges: Keith said she needs to connect with how she looks with how she sings. If she isn’t going to not use the guitar, throw it behind her and grab the microphone. Jennifer said she needs to keep pushing herself. She will get there. It was a sweet performance. Harry gets the feeling that she does not want to be there. He advises her to work on the things that are hard, that make her uncomfortable and she will improve. My thoughts: He is still sharp over the note. I’m starting to think it might be a bad habit that is just hard to change. But I loved the emotion and connection he had with the song that we could feel as well. The judges: Jennifer said he looks great tonight. She loved the performance of that song. Harry said he sang consistently sharp, but it was alright because he had conviction. Keith said all that is missing now is to make the song more of his own and not just do a straight cover. Where is his artistic take on it? My thoughts: It was a sweet performance. I think putting him in a more intimate context was better than what he did last week where he was lost on stage. But I worry about this. Will he be able to play in a big venue or is this more coffeehouse? The judges: Harry: Emotional dynamics–there has to be a change–there is just one beat with him emotionally. He needs to try something else. Keith: He understands what Harry is saying. The tone of his voice is like “butta.” If he made an album of original songs, he would buy that record. Jennifer said he has to push outside his comfort zone. My thoughts: It was a better song and performance from last week. More mature. There was a lot of heart in that. But there were still moments that were really rough. The judges: Keith stood up. Keith said it was a beautiful song baby. (First baby tonight). Encompassed vulnerability and range. Great job. Jennifer had goosies. She was all there for the story. And she had tears in her eyes because she is so proud of her. Harry said this felt very focused and it was risky. There were a few little problems but the message was there. My thoughts: I have no opinion about this. The judges: Jennifer said the feeling was there. Harry did not connect with it and he felt it was shouted. Harry has a record number of boos in one evening. Keith lost the story and emotion from him. He wants him to worry less about the technicality. My thoughts: The emotion was there, but the song was off key in parts it needed to be in key. I liked it in the beginning but when she tried to go big, that is when her voice failed her. She reminds me more of a Tracy Chapman type of singer. The judges: Harry enjoyed the beginning. Jennifer said she tried to do something but it didn’t work. Keith said they would see her next week. So in summary, tonight’s Idol was VERY disappointing. The only person who nailed it tonight was Caleb. MK is in serious trouble. She has a lovely voice but her lack of confidence in herself will ultimately be her downfall. Jessica might be in trouble as well. Picking a song is so crucial. And having a theme and having to pick a song that reminds you of home but may not be a good song for your voice all have to be considered. Tonight’s theme is “This is me.” The contestants have to choose one song that defines them as an artist and as a person. The sequence with the contestants on how the voting works this season was cute. There is a new voting platform on Google. 5 in 20: Scared of spiders, fell off a horse, did something with a butter knife (? ), first kiss was on a slide, broke his finger during football. My thoughts: That was rough for me. It was out of tune (sharp). He looked great though. The judges: Keith said he was a likable guy. He thought it was an excellent cover version of the song but now Dexter needs to figure out how to make it a Dexter Roberts performance. Jennifer said something similar. Harry wonders if the ear monitors are causing him to sing out of tune. There was a pitch issue. Jennifer added that it was not the sweet spot for his voice so much. 5 in 20: Afraid of dogs, plays a lot of instruments, wears glasses because she can’t see and she loves everybody. My thoughts: Nice upbeat song. I don’t think it was the right song for her. It did not showcase her voice well. I felt like I was watching a high school talent show. I really like her though. I hope she will do better next week. The judges: Jennifer loves her energy. Her performance was A-plus. The song had soul. It, however, was not her best vocal performance but says she is a contender. Harry agrees. He said intonation is huge. He mentions that she appeared nervous. Keith said what can you do from here forward? It’s about growing and learning. Her energy is contagious. She needs to figure out how to get on top of the song and not floating around it. 5 in 20: Her best friends are quadruplets. She loves swing dancing. She is bad at all sports. My thoughts: I like Kristen but it was off key. I don’t think this was the right song for her. Everyone is having pitch issues tonight. I felt like she was just singing. I didn’t feel any emotional connection from her to the song she was singing (and because of that, I did not feel anything). The judges: Harry thought that she was a really strong pop singer but she is singing out of tune. Keith thought it was a good song choice for her. She was able to show the range and show control and dynamics in a short space of time. Jennifer said to stop thinking (after seeing 3 contestants now). Start thinking about what you know versus what they are afraid of what may happen. 5 in 20: He can name every capital. He loves Tennessee football. His favorite animal is a kangaroo. He is good at throwing rocks at hitting poles. He wants to sky dive. He has a super power. And then states none of this is true. My thoughts: Finally a better performance this evening. Who knew I would like it too (because I don’t like country music). So that is how much I did love it. The judges: Keith said it was particularly brisk. He told him not to sacrifice his artistry in the midst of entertaining. Jennifer liked the fast tempo. She said it was a good example of taking a song that represents you and changing it up to make it yours. She loved it. Harry said he did not think it was kitsch (as Keith mentioned) at all. He liked the up-tempo. He felt it was the best performance of the night so far. 5 in 20: Doesn’t like climbing high things, hates icy roads in the wintertime, does not like to deer hunt that much, hates people with bad attitudes and no personality, and is very religious. My thoughts: I love CJ but this was the worst performance heard tonight so far. He was always above the note. The judges: Jennifer thought it was a lot of fun. She acknowledges there were pitch issues going on for everyone. Harry said CJ has this “cry” in his voice that he loves to hear but this song may have been among other ones during a concert. It was just an okay song choice. Harry is then booed. Keith disagrees. He thinks it was a good song choice and it was good to hear a different side to him tonight. 5 in 20: She is a mediocre snowboarder, played soccer her whole life, loves single ladies (and adds “the song”), wishes she was a dancer, loves dogs. My thoughts: It was average. She looked scared. The stage kind of swallowed her up. A few times it seemed out of tune (not on purpose), especially in the end part when she is singing “Satisfaction” a lot. I do like her new look and style. She looks wonderful in pink. The judges: Harry loves watching her grow. He gives her some pointers about her performance. Keith said he loved the way she looks. He said there were patches of good and patches of “deer in the headlights” but it will come. Jennifer loved how she delivered it. She was awesome. 5 in 20: Born in a leap year. She is left-handed, does the longboard, does ballet and likes to make her hair bigger. My thoughts: The beginning verses were rough. Too bad. I am a really big fan of hers and I would put her in the middle of the pack. The judges: Keith said it was a killer song choice. Janelle is a great place for her to tap into. She is just becoming more confident in what she is doing. Jennifer loves her individuality. She said the song was perfect for her and that she is blessed. Harry said his favorite thing about her is the mystery and how it will unravel. He thought it was terrific. 5 in 20: Her hair is actually brown. She is best friends with her brother. Her favorite movie is “The Wizard of Oz.” Her eyes are sometimes green and sometimes blue. She is really short. My thoughts: It started off rough but she found her groove in there. I liked it. This is my second favorite female performance of the night. The judges: Jennifer said she has such a unique voice, filled with dynamics and nuances–a powerhouse singer, too. It was a tough song but she pulled it off. Jennifer loved it. Harry said he felt the emotion of the song and that she makes interesting choices on a pre-existing melody, that her melodic choices drive the lyrics. Keith said it was pitchy in the beginning but once she leaned into it, she owned the song. 5 in 20: He loves extreme sports. He likes to write poetry. He is a hopeless romantic, loves coffee, and has never been…..(cut off). My thoughts: I had goosebumps. I loved it. My favorite performance of the night so far. He is so unique. A couple of notes were off, but not horribly. It was such an intimate performance. The judges: Harry said he was brave to do that but cautioned him to try to sing it in tune. He felt it was too inward and that he did not feel what Alex was singing about. Harry is booed again. Keith said he had the complete opposite reaction. It pulled him in. He wanted to know what Alex “had never been” but Alex does not even remember. Jennifer agrees with Keith that she got caught up in the emotion and mood of it. Jennifer did a nice job. She felt it was a nice change from what everyone else is doing. 5 in 20: She uses a lot of hand sanitizer and is obsessed by the supernatural. She likes ponies and has way too many animals. She failed band in school. My thoughts: I LOVED IT! I had goosebumps. Rocker girl after my own heart. It was my favorite female performance of the night. The judges: Keith said it was a bold but cool song choice. It reminded him of the first time seeing her from the audition cities. There was a dark, haunting quality to it and that is what she has as an artist. The edgy rasp is appealing. Jennifer said that the sound and power of her voice gave her goosies everywhere. It was her favorite vocal performance of the night so far. It was perfect. She would love to see Jessica’s body relax a little bit. It was dope. Harry was distracted by the graphic butterflies. He thought it was strong and that it was cool to hear her sing slightly differently. She did a nice, nice job. 5 in 20: Went to chef camp when she was younger. Her eyes change colors depending on environment and clothing. She does a cool whistle. My thoughts: She was wearing way too much makeup (not her fault). I did not care for it. I felt like she was singing it and never made an emotional connection to the song. She was hitting the high note (which always brings out the applause) but her lower register was rough. I really don’t know what the judges heard because they had a very different take on it. The judges: Jennifer said it is a tough song to take on but she did it beautifully. She thought it had a lot of emotion and her pitch was beautiful. Harry said it was great and she sang the melody well and conveyed the emotions well. Keith said it was one of his favorites of the night. He wants more yin-yang though. There was too much yin. 5 in 20: He is afraid of spiders. He wears size 10 shoes. He stepped on a sea urchin once and broke his ankle once falling down the stairs. His middle name is Joseph. My thoughts: It was okay. It seemed to drag a bit. I almost had the feeling that he wanted to sing it faster but the music was lagging behind. He’s in the middle of the pack for me, too. The judges: Harry said he wished his vocal mirrored the lyrics (that it wasn’t so clean and tight). It was nice but not great. Kevin said the tempo was slow. Sam had a great way of holding the center of his performance. Jennifer said he was a quiet storm. He needs to come alive. Sometimes he is a deer in the headlights. 5 in 20: Unfortunately they caught him brushing his teeth. Did he say he once kissed a cow? The second one was something about a pancake? His favorite band is Rush. He was on the cross country team in high school. He loves biscuits and gravy. My thoughts: GOOSEBUMPS!! (And hey look Taylor Hicks is in the house). Is Idol ready for a rock star winner? My favorite performance of tonight. This looked truly professional. I felt like I was attending his concert. The judges: Keith and Jennifer were on their feet. Keith said he has some serious pipes and it was a cool song. He said he needs to figure out now how to put on that twist–retro with a twist. Jennifer said he was so ready for the rock-star life. Harry said it was great to hear rock-and-roll on Idol. If something happened to Rival Sons like what happened with Journey, he could be it. Candice Glover sings!! And Jake Bugg. Malaya Watson is first through. She has SUCH a personality. Ben Briley (ditch the plaid dude). Emily Piriz. This surprised me. She has a good voice, but I didn’t like her song choice. Caleb Johnson (YAY). Note to Caleb: Do NOT maul Ryan Seacrest. And they finally took a commercial break. Jennifer Lopez explains. Of the 10 left, they are going to choose 5 to sing tonight so that from that they can pick 3 of them. CJ Harris. It was good. Singing for his life? Not really. Harry said both the band and CJ screwed that up. It was not a strong start; it was average. He did not feel any of the magic. Jennifer said the specialness of his voice and soul still came through for her. Keith said he has to stay emotionally connected to the song the entire way through; he was drifting in and out emotionally. Jena Irene. Playing keyboard. I hope she gets picked. I had goosebumps. Keith said it was a really good use of that moment. Spencer Lloyd. I think he should have chosen the “Say Something” song (as they pointed out to him just the night before). Jennifer thinks he picked the wrong song to sing again. Bria Anai. She was awesome. I know she will get a spot. Harry said she sang for her life but it was all over the place. She was clearly not expecting that comment. Kristen O’Connor. She was ahead of the band. It was not her best. The judges had a difficult time deciding on the 10 contestants that would be given the opportunity to perform for America’s votes this evening. They finally finished in the dressing room before the show started. Caleb Johnson (from Asheville–did I mention my sister lives there? Yes I have!) He sings, “Stay With Me” by Faces. The thing he needs to work on is closing his eyes while he is singing. Chris Daughtry says that he does not want Caleb’s intense face to distract them and to smile.” Caleb sings again, this time smiling. Chris adds, “Okay, halfway.” Adam Lambert hears that he wants to be “subtle over-the-topness” and laughs. I think Caleb looks great, sounds fabulous and he definitely improved with his eye-closing issues. He had the crowd eating out of the palm of his hand. He was in command! Keith said it was “killer dude.” He has soul, a cool thing in his voice that a person is just born with. There are some things you can’t learn. It was the perfect song and a great way to start the show. Jennifer said it was amazing, a real rockstarish, the real deal. “It’s your time.” Harry said it will be tough for the guys following him. It was a strong way to start the show and congratulations. CJ Harris. He defines himself as country soul. His guitar and voice were self-taught. Chris Daughtry said he was having a hard time following the guitar pattern, that it distracted from his amazing vocals and to ditch it. It would free him up to sell the song. He sang, “Shelter” by Ray LaMontagne. CJ ditches Chris’ suggestion to ditch the guitar. I’m not a guitar expert so I can’t comment on his guitar skills. I thought he slayed the song. He did a fantastic job and I like his new look, too. Jennifer said he makes her smile. She said he makes her feel so many things which is a beautiful thing. Harry said he was a great talent. He advised him to watch his intonation. Harry thought he had a tendency to sing really sharp. He felt like he was singing to him and that he was going to shelter him. Keith said it was a great mix of Dobie Gray and Jonny Lang blended in to this package that was so original. Emmanuel Zidor. He tells Randy Jackson that he has been “humming since the womb and singing since 5.” He wants to sing “Best of My Love” by The Emotions. The rehearsal clips looked rough. I was entertained by his performance and I love his positivity but he has a lot of work to do. I would put him in the middle of my pack. I am also glad he did not try for the falsetto that bombed in rehearsals. Harry said it was so much fun. It reminded him of the performers in New Orleans–happy, infectious energy. He recommended the same advice he gave to everyone else: “Stay in your lane.” Keith said, “I agree with Harry.” Harry said, “That’s my girl right there.” And things got awkward. I wonder if they are trying to capture the Adam Levine/Blake Shelton bromance vibe? Keith advised him to watch his adrenaline level because he was singing above the note; rein it in. Jennifer said, “I Zi-dore you. You belong on a stage.” She said it was not the best song for him. Then she asks him to sing a little bit of “I’m Going Down” and he does. That’s cheating a bit, Jennifer. Sam Woolf. He was just accepted to Berklee College of Music (Boston, MA). He sings, “Babylon” by David Gray. Michael Orland, the vocal coach, says that he is doing a lot of eye closing and looking down which can look like insecurity. I think he is nervous but he listened to the advice and I like when the contestants do that. I could hear his voice on the radio right now. I would even consider buying his record. He did a tremendous job. My favorite so far of the night. He has really won me over during the last two performances. Keith said, “The people like you Sam.” His voice is money. His tone is great. It was a good song for him. His performance will get better and better. Jennifer said he has a sweet quality. She hopes he can gain small degrees of confidence as the show goes on. George Lovett. He chooses “Grenade” by Bruno Mars. Adam helped him with some stage movement. He was very nervous. I did not like this song as a ballad. It sounded like he was dragging a bit behind the band. His voice cracked a few times. His pitch was rough at times. Jennifer said it was really good but he needs to control the runs; there were just too many. Harry said it was easy to come so invested that you can sing yourself right off the microphone. His passion spun out of control. Harry has heard him sing better (and Harry gets boo #2 for the Idol season). Keith said song choice is crucial and that this song did not play to his strengths. Dexter Roberts sings “This Ole Boy” by Craig Morgan. I like his makeover. I have no reference to compare this to, but I did find it enjoyable. Harry said there were good things about what he did. Keith said he was the real deal, a fully fledged country boy from Alabama. He was fun and easy to watch. He agreed with Harry about him needing to find out what separates him from all the country voices that sound just like him. Jennifer said it was easy in a cool way. She remarked that if he was nervous she did not see it. For American Idol, he did his thing. Alex Preston. YAY!!! He plays 11-12 instruments? Whoa. He sang, “Volcano” by Damien Rice. His challenge is also making eye contact. I could tell during his performance that he was really trying to apply the lessons he learned during the workshop. I LOVE IT. It was better than the original. My new favorite performance of the night. He has such a unique sound among the boys. Keith said it was the best song choice of the night and a good performance. Jennifer said it had such a groove that was different than anything else. He is in his own lane. If he stays there, he could go very far. Harry said music is a religion to Alex. He said his favorite part was that he ended on the “9” and that Alex knew what he meant. Ryan asked for Harry to explain and he did with Alex’s assistance. Malcolm Allen singing “Comin’ From Where I’m From” by Anthony Hamilton. I have never heard that song before. I think he still needs a lot of work on his stage presence. The stage swallows him up. He sings well, but there are some really talented guys in the mix this year. Jennifer said he has a great voice. She wanted his physical performance to hit her more. She said she should have gotten goosies on that–to hear the pain that is in that song. She needs him to bring his heart and soul to it next time. Harry said he is a good run singer, but the danger is singing in the exact same run over and over and over; it was the same five notes and he needs to sing it in tune which elicits boo number three for Harry. Keith said–oops he ran out of time to talk. He felt like he was at the Grammy’s. He told Malcolm he needed to make artistic choices and gave him a suggestion on how that could have worked. Ben Briley (aka “Gumbo”) I LOVE his makeover. He is singing “Soulshine” by The Allman Brothers Band. He also tends to close his eyes while he is singing. I really liked it. My judgment of him getting through over Neco Starr might have been premature and incorrect. I really truly enjoyed that. Harry said Ben seemed to like it and thought he (that he thought Ben thought) nailed it. It was a great job and was interesting. Keith said he has a great voice which was better than his guitar playing. Keith thought it was the first shredder solo on Idol. Jennifer commented that some people come alive when they are on stage versus in the rehearsal which is a sign of a true performer. Spencer Lloyd to the delight of all the teenage girls in the room. He sings, “Love Don’t Die” by The Fray. He asked for advice about whether to use the guitar or not with the performance. Randy said for him to sing with it. Adam Lambert and vocal coach Melissa Garcia said without the guitar. The song started off rough with a lot of notes out of key. Midway through though I felt he found a groove. Being a worship leader, I know he can get a crowd going and this crowd was going, going, gone. Keith said that song choice is important and this was not his best vocal performance tonight. Jennifer said he moved the crowd and that when he is up there, he is a star. Harry said the song, “Say Something” was his strong suit; this was not. He reminds Spencer to stick to what he knows. This was not good (and Harry was booed again). He told Spencer that singing ballads is good. The talent is abundant; the spaces few. Only 15 girls and 15 boys will go through to the live rounds next week. They had one last chance to impress the judges with their own instruments or the full band or both. Some standout performances for me were Jillian Jensen (FINALLY they show her!). Her original song was beautiful. Malaya Watson was out of this world. I cried listening to Sam Woolf’s original song that he wrote about his mother leaving. I had goosebumps. My opinion about him has radically shifted. I think it was a mistake letting Keri Ann Roche and Jesse Roach. They were unique. Madelyn Patterson, Michael Simeon, Lebryant Crew, Sabrina Lentini, Keri Lynn Roche, Jesse Roach, Casey McQuillen, Nica Nashae, Leah Guerrero. A few others whose face/name I could not place and the names were not said. They showed solos by Shelby Ann Marie Miller and Connor Zwetsch who performed original songs that were less than stellar. They did not go before the judges so I am assuming they went home. They leave us on a cliffhanger. They ask Casey Thrasher and CJ Harris to come up together and sing more before they can make a decision. The previews say that only one of them will be going through. These guys are both very talented. I would very much for them both to go through. According to the press release, America will get to vote on who the final contestant will be to round out the top 30 on Thursday night, February 13, 2014. Johnny Newcomb: I do not think it was good enough. Connor Swetsch: I liked it; first time hearing her. Ali Jane Henderson: I loved it; first time hearing her. Caitlin Johnson: I did not like it. It was bad compared to the first three. I was not a fan of hers in the San Francisco audition. Adam Roth (the sound healer): I still do not like his voice. Tristen Langley (Nikki McKibbin’s kid): Not bad. Morgan Deplitch: No for me; off pitch; last time in Austin she was too breathy. Stephanie Petronelli (the cheerleader): I still do not like her voice. Eric Wood: Liked it; liked him in Austin, too. Alyssa Siebken: Not good enough. Khristian D’avis (aka fake-accent girl): No from me. They were broken up into two groups. One group would be returned to the airport; one group would be going to the next round. There were 20 people in group 2 who were taken to the hotel. Among those going home was Caleb Hartsfield who is from my sister’s city of Asheville. Too bad; I liked his voice. There are 180 people going into Day 2. On this day, they put them in lines of 10 and have them sing a capella or with an instrument. In the first line, George Lovett, Sandie Lee, Brandy Neely, John Fox, and Majesty Rose York were through to the group round. Going home were Jack Janowicz from the Omaha auditions, McKenna Dennis from the Austin auditions, Viviana Villalon also from the Austin auditions, and very surprisingly Samantha Calmes who was one of my favorites. Out of the next group all we know is that Spencer Lloyd would be staying. In the next group, I thought Austin Wolfe had a good voice. 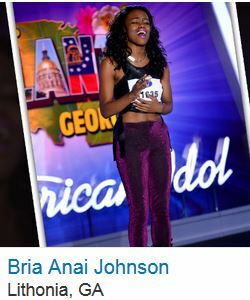 I loved Bria Anai‘s song. I did not like Selena Moreno‘s song, not just because she goofed up but she is not on the same level as some of these other singers. Going through to group rounds were Austin Wolfe, Jessica Meuse, Bria Anai Johnson, Shanon Wilson. Selena Moreno and Lauren Ogburn from the Atlanta auditions would be returning home. In the next group, I like Sam Woolf but he may not be ready for Idol (at least this year’s talent) Keri Lynn Roche‘s song I loved. I was a “no” for Ayla Stackhouse. I adore CJ Harris. John Martin Davis and Ayla Stackhouse as well as another male who was standing in the forward line in a blue plaid shirt who I cannot identify were going home. Keri, CJ, Sam, and a few others I cannot identify by face are through to the next round. Alex Preston, Sydney Arterbridge, Jesse Roach (Cypress, Texas), Brian Watt, Jade Lathan, Lindsay Bell, David Luning and a few others are in the next group. I loved Alex. Sydney’s vibrato bothers me. I liked Jesse. Brian has a nice voice but when I listen to him compared with the others, it is just not as good as some. Alex, Jesse and a few unidentified individuals have made it through to the next round. Brian, Jade, Sydney, David and Lindsay are going home. Madelyn Patterson is in her own segment for #IdolHollywood or #IdolHome. I felt it would be #IdolHome as I did not enjoy it. Sixty percent felt she would remain in Hollywood and 40% said she would be going home, but she is through to the next round. In the next group, they showcased Kenzie Hall and Quaid Edward. I don’t think Quaid is ready but he will get there at some point. Kenzie has such an interesting sound and niche in the competition. Kenzie is through and Quaid is sent home. Then there are 10 people who make it through (but they were in a bunch of different groups). Ben Briley (I did not like this version of “Stars”.) Briston Maroney (Royals? This is a “no” on the song choice for me but the sound of his voice is unique). Dexter Roberts (The one I liked the best out of these three men). Rachel Rollier (I like her voice). Maurice Townsend (Wonderful). Casey Thrasher (Very nice. He did so much better than his audition). Tiquila Wilson (Loved her). Emily Piriz (I did not like her voice today). Malcolm Allen (Goosebumps). Munfarid Zaidi from a close-by town of Sugar Land, Texas always adds the fun factor to the show. I think Idol needs at least one. I liked Ethan Thompson‘s performance. Austin Percario was okay. Love the rocker Caleb Johsnon. I think Stephanie Hanvey‘s performance to too affected. I loved Kristen O’Connor‘s solo. I also loved Emmanuel Zidor‘s solo as well as Briana Oakley and Jesse Cline. Keith London made an odd choice in song. I loved his voice but I agree with the judges. Allie Odom, Symphony Howlett, Olivia Diamond, Keith London, and Donald Reed are through to the next round as well as Munfarid, Ethan, Austin, Caleb, Stephanie, Kristen, Briana, and Jesse. For the last line, Malaya Watson was up. I am not sure about her based on this song. I enjoyed Jena Ascuitto‘s performance. Savion Wright, a local Houston favorite (as well as my own), sang a song for his brother who had recently died (at the time of Hollywood week). On February 5, 2014, the Sabine County District Attorney released a statement that said he has turned the ongoing Alfred Wright case over to the Texas Attorney General’s Office. I love Savion. I had goosebumps. All three contestants are through. Immediately, Casey Thrasher, Ben Briley and Dexter Roberts teamed up to form the Backstreet Cowboys. Austin contestants Savion Wright, Ryan Clark, John Fox and Madelyn Patterson teamed up. Matthew Hamel, Jessica Meuse, and Clark King teamed up. Clark was losing his voice. Matthew and Jessica found other groups. Malaya Watson, Christine Collins, Olivia Diamond and Queen Bulls teamed up. Clark King decides to drop out. Veterans from Season 12 of American Idol, David Oliver Lewis, Sarina Joi Crowe, and Tony Foster Jr. teamed up to form “Three More Days“. They choose “Too Close” by Alex Clare. It was lovely! Well done! But not everyone can go through and this time it was Tony’s turn to go home. He was genuine when he expressed a desire to know why so he could learn from the experience. I thought that was pretty wonderful instead of pouting and demanding to know why. Harry tells him that he looked at his feet too much. Tony has a wonderful attitude. I hope he comes back next year. Dexter Roberts, Ben Briley and Casey Thrasher, the “Backstreet Cowboys” sing “I Want It That Way” by the Backstreet Boys. It was the first country boy band and it worked. I loved it. All of them are going through to the next round. Neco Starr, George Lovett and another individual did “Treasure” by Bruno Mars. I enjoyed this. Paula Hunt, Andrina Brogden and another unknown individual teamed up. MK Nobilette and Briana Oakley were part of another group and they made it through to the next round. Brandy Neely, Emily, and Kenzie Hall were all through. Spencer Lloyd, Megan Miller and Alyssa Siebken teamed up. Megan forgot the lyrics. The group fell apart. Alyssa was sent home but she felt that she was set up by the others. Other people leaving after group rounds were Madisen Walker, Keith London, Austin Percario, Stephanie Petronelli, and Adam Roth. Tiquila Wilson respectfully quits; she does not feel this is the correct path for her. The next group consisted of CJ Harris, Caleb Johnson, Tyler Ahlgren and Matthew Hamel also sang “Too Close” by Alex Clare. Caleb reminds me of the rocker Meatloaf. CJ and Caleb are through; Tyler and Matthew are sent home. Members of the group “Collision” were all through. The group “Clarity” was made up of Jena Ascuitto, Sikenya Thompson, Munfarid and Allie Odom. Sikenya barely had a voice. She had lost her confidence. The judges encouraged her to push through and she did. Unfortunately Allie was the weaker link and someone has to go. Savion Wright, Ryan Clark, John Fox and Madelyn Patterson sang “Royals.” I thought it was fine. But John J. Fox of Magnolia, Texas (the town right next to me) is going home. The next group was Nica Nashae, Stephanie Hanvey, Cara Watson and Jessica Meuse. Stephanie’s mom was overbearing, trying to run the show. I really dislike stage moms like this. The psychology behinds it suggests that they are pushing their children to achieve recognition for themselves. They sing Beyonce’s “All The Single Ladies.” Stephanie was terrible and she goes home, not without some final words from mom. Terrica Curry, Carmen Delgina and Emmanuel Zidor teamed up to become “Love’s Angels.” Only Emmanuel makes it through. Loud & Fierce members Malaya Watson, Queen Bulls, Christina Collins, and Olivia Diamond did not do very well. Out of all of them I liked Malaya’s performance the best. They, however, are all through. At this point 77 contestants remain. Solo rounds start on Wednesday, February 12.